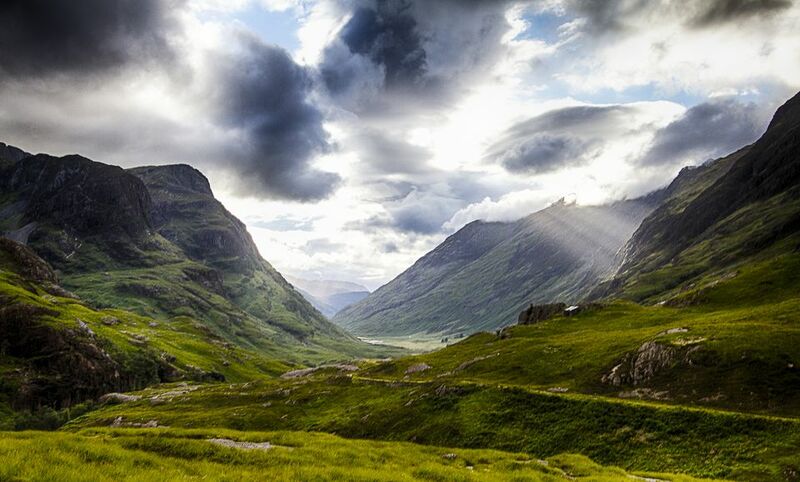 Visitors voted Glencoe Scotland's most romantic glen. Find out why. The rugged, bare mountains of Glencoe gaze down, dark and unforgiving, on a windy lonely landscape of rock strewn hills and empty meadows. There are 8 Munros (Scottish mountains of more than 3,000 feet), their flanks long ago stripped nearly bare by sheep and deer. Popular with mountaineers, this is one of Scotland's most ancient landscapes, the remnants of a volcanic caldera formed more than 450 million years ago. In Scots Gaelic mythology, it's the legendary home of Celtic hero Fingal and his son Ossian, remembered in Ossian's Cave, a large and dramatic feature on Aonach Dubh (The Black Ridge), part of a Glencoe massif also known as the Three Sisters. But its most notorious, and most tragic, claim to fame is as the site of the Glencoe Massacre of February 13, 1692. It's a complicated story of clan enmity, politics and betrayal but I'll have a go at passing on at least the bare bones. The MacIains of clan MacDonald had lived in Glencoe for hundreds of years. They had been brought to the land by an ancestor who fought beside Robert the Bruce at Bannockburn. At one time, the MacDonalds were among the most powerful clans in the Highlands and held the title of Lords of the Isles. Their traditional rivals were the clan Campbell and together they had engaged in generations of low-key feuding that consisted, for the most part, of cattle raids and poaching each other's territories. Probably a bit like the Hatfields and the McCoys. By the late 15th century, the MacDonalds had lost much of their power. In 1493, the Campbells helped James IV, Stewart King of Scotland, abolish the MacDonalds' Lordship. Their lands, including Glencoe were confiscated by the Crown. After that, the MacDonalds had no legal claim to the lands they had traditionally farmed. But they held onto it by the power of the sword. They became the tenants of several different clan chiefs. What happened next is rather confused. Political hostility grew between the Campbell's and the MacDonalds over the Campbell's influence at court and as an arm of the Establishment in the Highlands. Then, in the 17th century, the MacDonalds chose the losing Jacobite side against the Protestant King William of Orange, monarch of England and Scotland. When Catholic King James III fled England for the Continent, they sided with the Catholics. In 1691, tired of all the continual raiding and warfare in Scotland, King William offered a pardon to the Highland clans who had rebelled against the Crown provided they stopped raiding their neighbours and agreed to swear an oath of allegiance before a magistrate by Januay 1, 1692. The alternative, the King promised, would be death. The head of the MacDonald clan held out as long as possible but finally agreed. Unfortunately for his clan, he went to the wrong castle to swear the oath - Inverlochy near Fort William instead of Inveraray near Oban. By the time he reached Inverary, the deadline had passed by 5 days. Having taken the oath, MacDonald assumed his clan was safe. But actually the order to exterminate them had already been given and a force of 130 soldiers had been sent to Glencoe. What makes the Glencoe massacre so horrific is that the MacDonald families had, like their leader, assumed they were safe. They welcomed the soldiers into their homes where they entertained them for 10 days. Then, on the night of February 12, on secret orders (some say from their Campbell captain, some say from the King himself) the soldiers rose up and murdered between 38 and 40 MacDonalds, men, women, children and the elderly as they slept in their beds. The rest fled into the mountains. The popular story is that they died there of exposure or starvation. But, it's more likely that they dispersed into the mountains and caves they knew well (after generations as outlaws and cattle rustlers) and survived. The National Trust for Scotland Visitor Center, off the A82, is a good place to start, with interactive displays that explain the development of the landscape, the local flora and fauna and this history of Glencoe, including all the complicated developments that led to the massacre. Several easy, low level, circular walks start at the center. Beside the exhibition, the center has a shop, a cafe, an outlook station where you can plan your walk or get advice from a ranger, and a viewing platform where you can use the center telescope to search for buzzards, golden eagles and pine martens. The center is open year round but hours vary with the seasons. Visit their website for up-to-date hours and admission fees. Visit the Glencoe and North Lorn Folk Museum housed in a terrace of traditional, 18th century thatched cottages in the village of Glencoe near the A82. The museum's collections include Jacobite relics, costumes, toys and domestic utensils and weapons found in the thatched roofs of local houses, concealed after the massacre for more than 200 years. Have a family day out at Glencoe Activities. This multi-Activity Center in Ballachulish offers cycling, climbing, white water rafting, river bugging, canyoning, bridge swinging and a range of other high adrenalin activities. For the less adventurous, there's bike hire, forest walks, mountain biking and gorge walking - a water-based activity they claim is suitable for families with small children. And if your game is tamer (my hand shoots up here) you can try such low adrenalin activiies as archery, laser clay shooting, nature trails, electric bikes and golf. Visit their website for the full range of activities and prices. Go Skiing. The Glencoe Mountain ski resort is one of Scotland's more remote ski areas, with lifts and runs in the very dramatic Rannoch Moor, near the head of the glen.